Classically, states of matter are distinguished by changes in the properties of matter related to external factors such as pressure and temperature. States are usually distinguished by a discontinuity in one of those properties: for example, raising the temperature of ice produces a clear discontinuity at 0 °C as energy goes into phase transition, instead of temperature increase. 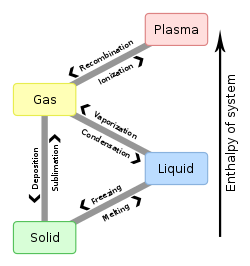 The classical states of matter are usually summarised as: solid, liquid, gas, and plasma. In the 20th century, increased understanding of the more exotic properties of matter resulted in the identification of many additional states of matter, none of which are observed in normal conditions. Amorphous solid: A solid in which there is no far-range order of the positions of the atoms. Crystalline solid: A solid in which atoms, molecules, or ions are packed in regular order. Plastic crystal: A molecular solid with long-range positional order but with constituent molecules retaining rotational freedom. Quasi-crystal: A solid in which the positions of the atoms have long-range order, but is not in a repeating pattern. Liquid: A mostly non-compressible fluid. Able to conform to the shape of its container but retaining a (nearly) constant volume independent of pressure. Liquid crystal: Properties intermediate between liquids and crystals. Generally, able to flow like a liquid but exhibiting long-range order. Disordered hyperuniformity: A state similar to a liquid and a crystal in properties. Like a crystal, its particles over large distances exhibit uniform density and are unable to compress. Like a liquid, its particles at smaller distances display the same physical properties in all directions. Gas: A compressible fluid. Not only will a gas conform to the shape of its container but it will also expand to fill the container. Plasma: Free charged particles, usually in equal numbers, such as ions and electrons. Unlike gases, plasmas may self-generate magnetic fields and electric currents, and respond strongly and collectively to electromagnetic forces. Degenerate matter: matter under very high pressure, supported by the Pauli exclusion principle. Electron-degenerate matter: found inside white dwarf stars. Electrons remain bound to atoms but are able to transfer to adjacent atoms. Strange matter: A type of quark matter that may exist inside some neutron stars close to the Tolman–Oppenheimer–Volkoff limit (approximately 2–3 solar masses). May be stable at lower energy states once formed. Photonic matter: Inside a quantum nonlinear medium, photons can behave as if they had mass, and can interact with each other, forming photonic "molecules". Quantum: A state that gives rise to quantized Hall voltage measured in the direction perpendicular to the current flow. Quantum spin Hall state: a theoretical phase that may pave the way for the development of electronic devices that dissipate less energy and generate less heat. This is a derivation of the quantum Hall state of matter. Bose–Einstein condensate: a phase in which a large number of bosons all inhabit the same quantum state, in effect becoming one single wave/particle. This is a low energy phase that can only be formed in laboratory conditions and in very cold temperatures. It must be close to zero Kelvin, or absolute zero. Satyendra Bose and Albert Einstein predicted the existence of such a state in the 1920s, but it was not observed until 1995 by Eric Cornell and Carl Wieman. Fermionic condensate: Similar to the Bose–Einstein condensate but composed of fermions, also known as Fermi-Dirac condensate. The Pauli exclusion principle prevents fermions from entering the same quantum state, but a pair of fermions can behave as a boson, and multiple such pairs can then enter the same quantum state without restriction. Superconductivity: is a phenomenon of exactly zero electrical resistance and expulsion of magnetic fields occurring in certain materials when cooled below a characteristic critical temperature. Superconductivity is the ground state of many elemental metals. Superfluid: A phase achieved by a few cryogenic liquids at extreme temperature where they become able to flow without friction. A superfluid can flow up the side of an open container and down the outside. Placing a superfluid in a spinning container will result in quantized vortices. Supersolid: similar to a superfluid, a supersolid is able to move without friction but retains a rigid shape. Quantum spin liquid: A disordered state in a system of interacting quantum spins which preserves its disorder to very low temperatures, unlike other disordered states. Heavy fermion materials: Heavy fermion materials or strongly correlated Fermi systems form a new state of matter that defines by quantum phase transitions, and exhibits a universal scaling behavior of its thermodynamic, transport and relaxation properties. Quantum spin liquid, quasicrystals, 2D Fermi liquids, heavy-fermion metals and heavy-fermion superconductors can belong to the new state of matter. String-net liquid: Atoms in this state have apparently unstable arrangement, like a liquid, but are still consistent in overall pattern, like a solid. Supercritical fluid: At sufficiently high temperatures and pressures the distinction between liquid and gas disappears. Dropleton: An artificial quasiparticle, constituting a collection of electrons and places without them inside a semiconductor. Dropleton is the first known quasiparticle that behaves like a liquid. Time crystals: A state of matter where an object can have movement even at their lowest energy state. Rydberg polaron: A state of matter that can only exist at ultra-cool temperatures and consists of atoms inside of atoms. Quark–gluon plasma: A phase in which quarks become free and able to move independently (rather than being perpetually bound into particles, or bound to each other in a quantum lock where exerting force adds energy and eventually solidifies into another quark) in a sea of gluons (subatomic particles that transmit the strong force that binds quarks together). May be briefly attainable in particle accelerators. For up to 10−36 seconds after it , the energy density of the universe was so high that the four forces of nature — strong, weak, electromagnetic, and gravitational — are thought to have been unified into one single force. The state of matter in this time is unknown. As the universe expanded, the temperature and density dropped and the gravitational force separated, which is a process called symmetry breaking. For up to 10−12 seconds after the Big Bang, most scientists think that the strong, weak and electromagnetic forces were unified. The state of matter in this time is unknown. This page was last edited on 18 April 2019, at 20:34 (UTC).